This study investigates becoming an artist and teacher and, in doing so, explores the ways that artist and teaching practices interact and the implications this interaction can have upon beginning teachers’ transition into professional practice. The impetus for this study derives from an identified need for research to deliver further insight into the challenges inherent to becoming an artist and teacher (Graham & Zwirn, 2010; Hall, 2010). A hybridised methodology is adopted, where methods integral to autoethnography, narrative inquiry and a/r/tography are drawn together to generate a series of intricately layered insights into becoming an artist and a teacher. The study explores becoming an artist and teacher from three distinct participant perspectives: early career (myself), and established and master artist and teacher (two other participants). Within this hybridised framework, I interweave the creative and analytic, where our perspectives of experience acknowledge how "the self does not exist in isolation" (Griffin, 1999, p. 51), and we can explore becoming through the shaping and sharing of our stories. Subsequently, this study encourages powerful connection making where the creative qualities of the study help activate and increase reader transferability (Huberman, 1989; Webster & Mertova, 2007). The reader is introduced to an eclectic collection of literature pertinent to what is already known about becoming an artist and teacher. It is here that the analytical lenses through which the reader is encouraged to examine the ways artists and teachers attend to the negotiation of relationships inherent to their practices are extrapolated. 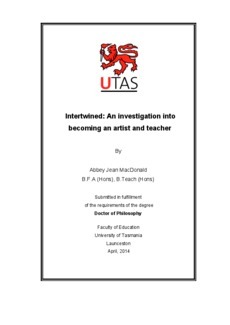 In examining the literature around artists, teachers and the formation of professional identity and practice, I surface what is already known in regard to how and why artists become teachers, and how pre-service art teachers are prepared for the challenges of professional practice and negotiating balance between artist and teacher selves. In offering an existing picture of what is already known about becoming an artist and a teacher, the reader can orient themselves with the issues identified as being at the heart of the research reported in this thesis.